I'm not white. Not that there is anything wrong with that, it's just that I am probably not as into the band Journey as you are. I like the band Gogol Bordello. There is a lot to like! Gypsy-manic-tongue-in-cheek-punktastic! To boil it down, it reminds me of my own heritage. My parents are both from the Middle-East. When mom and Dad would entertain guests, they would always crank the tabla and violin music. Alcohol, dancing, jokes, laughing...and always the repetitive arabic drum and the fast paced vibratos of the violin. I wished I could be out there with the adults, instead of falling asleep with my ear to the door. As I got older, the music of choice was often punk music and reggae. Bob Marley was maybe the best of both worlds to me. Punk AND reggae. Then there was my whole Ska period. 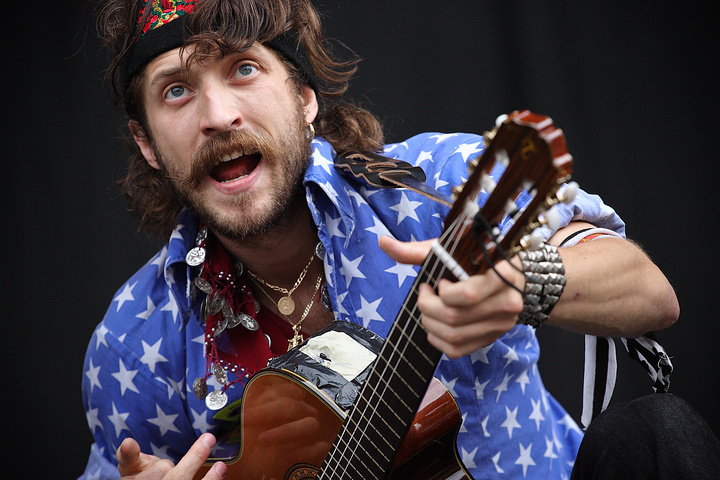 It's not surprising that I would be into the Eastern European sounds of Gogol Bordello. What was surprising was how much it reminded me of my childhood. I kinda want to listen to Trans-Continental Hustle through the walls in another room...no, that's not right...I wanna drink, dance, and laugh with the album on full volume! I kinda want both! This album really felt different to me. Better than previous albums, but I couldn't put my finger on it. I thought that it must just be the skills built up from a tour hardened band. Tight and together. it all made sense once I discovered that the lead singer/songwriter, Eugene Hutz, had moved to Brazil follow a girl. A long the way he discovered and worked with many amazing musicians there. Most notably, my favorite World Music artist, Manu Chao. I hear the influence of playing with all these South American artists has done to Hutz. Me gusto mucho! If you are already familiar with Gogol bordello's discography, then you probably already have this disc in your collection or loaded onto your iPod. If not...the links are below.